30 cm 32 p. : ill.
Book & CD. 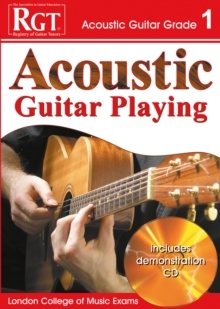 This book is part of a series that forms an expertly structured and comprehensive method of studying acoustic guitar; it has been compiled by the Registry Of Guitar Tutors -- the world's leading authority on guitar education. The book is very user-friendly as it is written in easy-to-read TAB, as well as traditional notation, and it comes with a free 21-track CD so you can 'listen and learn'. This book covers all the material needed for the RGT Grade One examination in acoustic guitar playing, enabling you to study for an internationally recognised qualification. However, even if you do not intend to take an exam, this book will help you achieve your full potential as a guitarist by developing all aspects of your playing in a structured way. This volume includes essential chords, scales, strumming patterns, fingerstyle studies and attractive well-known melodies, plus chapters on musical knowledge, accompaniment playing and aural exercises to develop your musical abilities -- making it ideal for novice players, whether children or adults, in the early stages of learning.